It is difficult to let go of paper data because we are not sure of its value in the future and the desire to have a tangible format. When purging paper, start with small chunks, such as one file drawer or one desktop pile to go through. It doesn’t need to be all done in one day or at one time. For most documents, users will be able to ascertain what to keep and what can be recycled. It is reasonable to keep some mementos of past history but keep it down to a small file folder size. Is there any action required? If not, you can probably get rid of it. Is it already saved electronically? If so, then you recycle the paper. Will the organization ever need, want or find value in this information again? If yes, then consider scanning the information to store it electronically. Is the information outdated and/or superseded? If yes, then recycle it! Is the information located on the organization Intranet network? If quick reference to the document is not needed, then recycle the paper and access the data electronically. Does the document or file have legal (current or future) implications? If so make sure there is an electronic copy or it is scanned in. Is there any legal retention requirement to keep the data? Documents if saved in an electronic PDF format are sufficient for any legal requirements. For more information on how you can become paperless in your office, read the article, Becoming Paperless for Effectiveness and Efficiency. Contact us if you would like assistance in organizing your office or computer. It is hard to decide what to keep and what to get rid of, especially in the information age. We seem to be consuming more paper than ever. According to the HP Internet Printing Index survey workers say they print pages from the Internet an average of 32 pages a day. US companies still file 120 billion sheets of paper annually. Since over 80% of the paper we file is never referenced again, it makes sense to purge your desk and filing cabinets to get a fresh start. Consumer Research Institute reports that the average American throws away 44 percent of their junk mail unopened. In addition we sometimes pick up information, just because it is information. 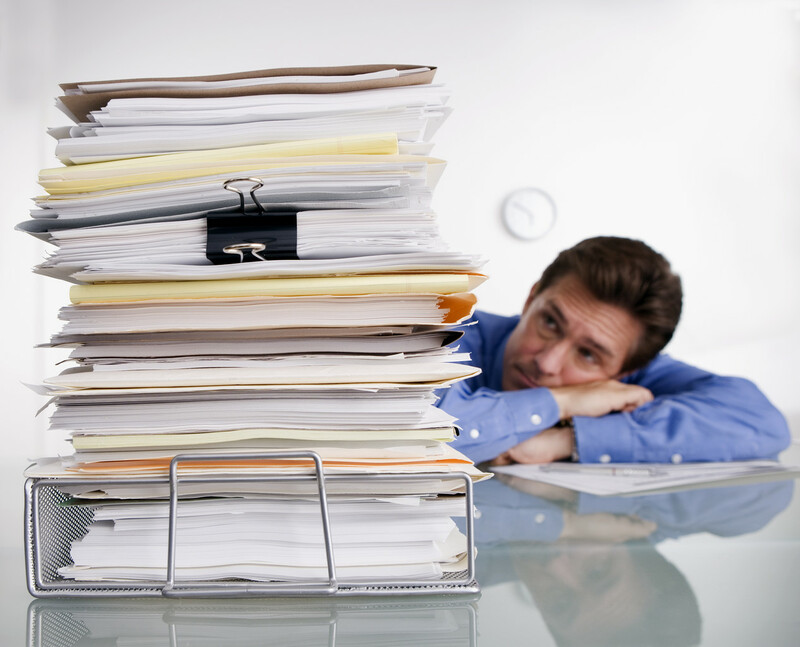 Ask yourself, “Do I really want it?”, before collecting more paper in your office. The reality is that we are creating our own paper pile up nightmare! Seize the day and throw away! Some documents need to be kept. For example, financial and tax documents need to be kept for the IRS for 7 years. Often you need to keep paper documents only for a short period of time, but can then dispose of it because you have a record of it electronically. Create a “pending/waiting” box on your desk for such papers that you only need temporarily. Then you can periodically purge it as the issue resolves itself.